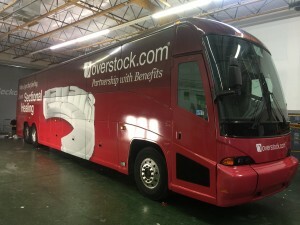 Overstock.com Las Vegas Bus Wrap. This 45 foot MCI charter bus was wrapped by GeckoWraps in Las Vegas with Avery MPI 1005 & Laminated with Gloss Avery DOL1060 matching laminate. Printed with our high quality Mutoh printers, profiled to hit that bright vibrant red, Was installed by the Gecko Wraps graphics & wrap installation team. With a 12 hour rush turnaround, our team was able to wrap this bus completely with an overnight install and had it ready for pick up by the morning ready for its trade show event. Now that convention season is here. This Charter Bus wrap was a perfect opportunity for Overstock.com to rent a bus all week long, using it for transporting vendors, employees and all their VIP guests all around Las Vegas with this stunning advertising wrap. 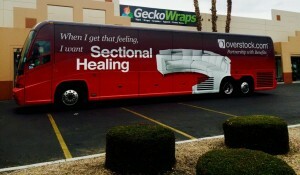 Once they are done with this trade show, the bus comes back to Gecko Wraps for removal and returned back to the charter company like it was never there. 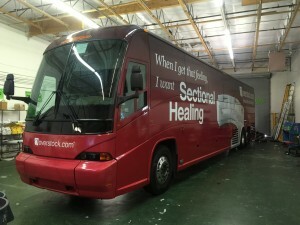 If your in need of a bus wrap for your upcoming convention or trade show and would like assistance in arranging the rental and the advertising wrap. 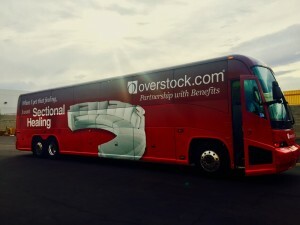 We are a full serive shop and can project manage the entire process from start to finish.